SO MANY SHOWS, so little time. Oh, I'm not talking about all the new fall shows being trotted out on the major networks -- I'm talking about the shows premiering on HGTV. HGTV actually debuts shows monthly, but the channel with nearly 24-hour coverage of all things home and garden offers a bundle of them at the start of each quarter (the premiere of "Haulin' House" on Nov. 5 rounds out the fall season). Greg Tufaro, Nicole Faccuito and Steven Lee host "What's Your Sign Design. HGTV reaches more than 91 million households nationwide, and August brought the highest ratings ever. In honor of the network's achievements, here's a take on five recent shows that are gaining notice. Some debuted in late summer, slipping in quietly; others had the red carpet rolled out for them this fall. Two favorites are earmarked, a couple of pleasant surprises and one show that may need more time to find its footing. Also included is a list of all the most recent arrivals and those due next month. Plus, Melissa Sykes, senior vice president of original programming, weighs in on some of the newer fare. Programs are rated based on a 4-house scale. What they say: Can warring astrological partners really agree on the look of a room? Zodiac charts and fresh paint mix on "What's Your Sign? Design." An expert designer and a talented astrologer make it work using creative design and a little help from the stars. What we say: If you're skeptical about the validity of astrology, don't let a little wariness rule your house. This show is all about pure pleasure, and the occasional squabbles between warring roommates and couples -- and between designer and astrologers -- take a back seat to the challenge of creating rooms based on zodiac signs. The design team takes you along to the stores, and the cameras flit back-and forth between worried homeowners and the in-process room makeovers. Plus, it's always fun to see an impassioned astrologer fight with a well-meaning designer. ("That's not what a Pisces is all about!") Adds Sykes: "There's a playful aspect, but it's also a great way to get people to talk about compromises and collaboration." 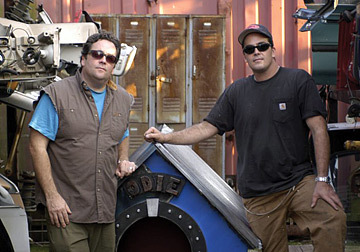 What they say: Each night Steve and Jim Kelley search out items destined for the trash and make them into stunning pieces of furniture. You'll love watching the family's surprise when they realize that their trash has been successfully JUNK'd by the Junk Brothers. What we say: The most clever aspect of this Canadian import surely lies in the premise: Siblings swipe furniture that homeowners have kicked to the curb and then put it back all nice and new-looking. The bros knock on doors after dropping off the now-improved castoffs on the lawns of unsuspecting homeowners, then watch from afar as dumbfounded owners try to figure out what happened. There are no slap-and-dash paint jobs. The brothers' pick furniture with good bones and often long histories (read: antiques) and items are lovingly resurfaced, refinished and restored into truly "show-worthy" pieces. Brothers John and Jimmy DiResta, hosts of "Hammered." "Hammered with John & Jimmy DiResta"
What they say: Jimmy DiResta can make anything and John DiResta can make anything hilarious in this half-hour of hard-core building. A catapult, an ice rink, brick barbecue, go-cart, fish tank, blown glass, a neon sign -- Jimmy, a master builder, has a million trade secrets. John, a professional comedian, has a million quips and questions for his brother. Home improvement just met the last comic standing. "Save Us From Our House!" What they say: The house-saving team responds to frantic families who have been suffering in their space. Relationship strategist Hina Khan tackles the emotional damage and leading contractor Scott Puddicombe and his crew break down the literal walls. The team brokers peace between the family and house at the same time. What we say: Another show pairing couples with a mediator and a designer? Yes, but this one has good pacing, compassionate professionals with distinctive personalities and design concepts not seen before. "Save Us from our House" gets it right. It just goes to show that a cast's chemistry and tight editing truly make a difference -- much like the difference between the late "Friends" and its sitcom clones. What they say: If only you could order up an extreme makeover on your housemate! This series brings a life coach and a designer together to help sparring couples and roommates get creative at mixing it up with design styles. The life coach's job? Help the relationship work. The designer's job? Help makeover one room into something everyone loves. "People come together as adults but they each have an individual history, taste and belongings, and it can be hard to make it work together," said Sykes. "It's part of our design-block therapy." What we say: This show could very well be for you, but slow pacing, uninspired designs and a life coach who is more ingratiating than insightful get it out of the gate slowly. It's not the couples who have boundary issues: The life coach observes bickering couples as if he were Big Brother, watching on cameras and calling individuals over a loudspeaker when they're misbehaving. Think being called to the principal's office ... but less fun. "Hidden Potential" (8:30 p.m. Sundays): Potential homebuyers examine homes that need a bit of work, and in the process are shown what the house could look like, with the help of computer-generated graphics. You'll find out which homes the buyers choose. "Picking Up the Pieces" (10 p.m. Sundays): An anthology of half-hour programs that serves as a window into the lives of people coping with the aftermath of natural or manmade disasters -- and the loss of their homes. "24 Hour Design" (8:30 p.m. Fridays): A team has a $2,000 budget to put together a room in a day. Viewers will see the transformation, start to finish. "It shows you what you can do in one day," said Sykes. "Design Match" (4 p.m. Saturdays): Amateur designers square off, following a professional designer's plans -- without the designer budget or the designer. Only the winner gets to actually keep the furniture. "Designer Guys" (5 p.m. Saturdays): Hip hosts Allen Chan, Anwar Mukhayesh and Matt Davis draw from architecture, interior and industrial designs to change up workplaces and home offices across Canada. "House & Home" (5:30 p.m. Saturdays): Each week host Lynda Reeves poses a design-related question, then tries to find the answer in upscale homes around the country. "Making of a HGTV Design Star: David Bromstead" (premieres 11 p.m. Nov. 2): Viewers are taken behind the scenes in the filming of the contest winner's new show. 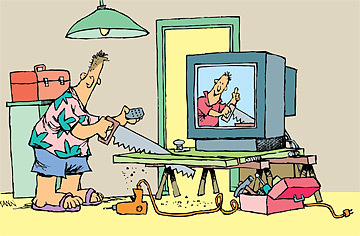 "Over Your Head" (premieres 11 a.m. Nov. 4): Host Eric Stromer helps people stuck in the middle of renovation disasters. "Don't Sweat It" (premieres 11:30 a.m. Nov. 4): Steve Watson helps homeowners with projects they've put on the backburner. "Haulin' House" (premieres 8 p.m. Nov. 5): Homeowners literally pack up their homes and take them to new homesteads. "People for various reasons have to move and it's exciting to be along for the ride," said Sykes.